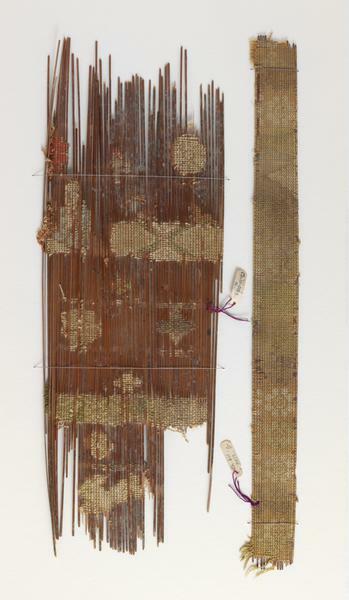 These parts of a sutra warpper are of bamboo splints held together by bands of twined silk. They were recovered from Cave 17 of the Mogao Grottoes. This shrine site is one of China’s great Buddhist pilgrimage complexes and is situated near the oasis town of Dunhuang. The site is part of an area of Central Asia now called the Silk Road, a series of overland trade routes that crossed Asia, from China to Europe. The most notable item traded was silk. Camels and horses were used as pack animals and merchants passed the goods from oasis to oasis. The Silk Road was also important for the exchange of ideas – while silk textiles travelled west from China, Buddhism entered China from India in this way. These pieces were brought back from Central Asia by the explorer and archaeologist Sir Marc Aurel Stein (1862-1943). 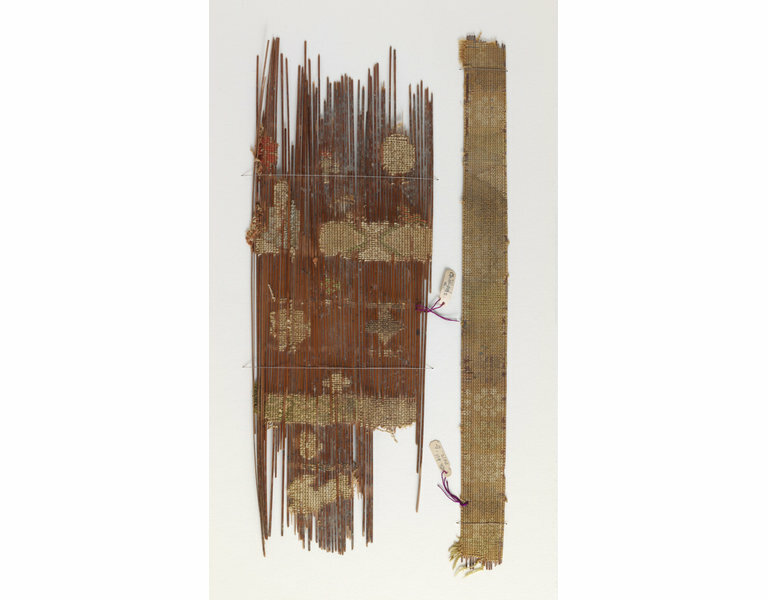 The Victoria and Albert Museum has around 600 ancient and medieval textiles recovered from the Silk Road by Stein at the beginning of the twentieth century. Some are silk while others are made from the wool of a variety of different animals. 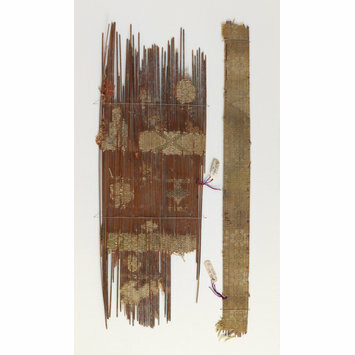 Two sutra wrapper pieces of bamboo splints held together by bands of twined silk. The larger piece show bands of a lozenge design, a seated Buddha in the upper left corner and some kind of four-legged animal at the bottom. The narrow piece show a floral pattern. Weft: bamboo splint, single, 7 wefts/cm. Attached to pieces are tag labels showing Stein number possibly in Stein's handwriting or that of his assistant, Miss Lorimer. Stein, Aurel, Serindia: Detailed Report of Exploration in Central Asia and Westernmost China Carried Out and Described Under the Orders of H.M Indian Government , 5 vols (Oxford: Clarendon Press, 1921), vol. II, p.1014. Zhao Feng, ed. Textiles from Dunhuang in UK Collections. Shanghai: Donghua University Press, 2007. pp. 267.